I can honestly say, this set is by far the most beautiful set of dice I’ve ever made. It was crafted from instrument grade Honduran Rosewood Burl giving the set a decidedly musical note when rolled. Just shaking the box will cause a glass like tinkling. The grain pattern is nearly indescribable, with wild striations of contrasting blacks, and violet browns that polish to a glass like finish with a seemingly metallic depth and a slight opalescence shimmer. 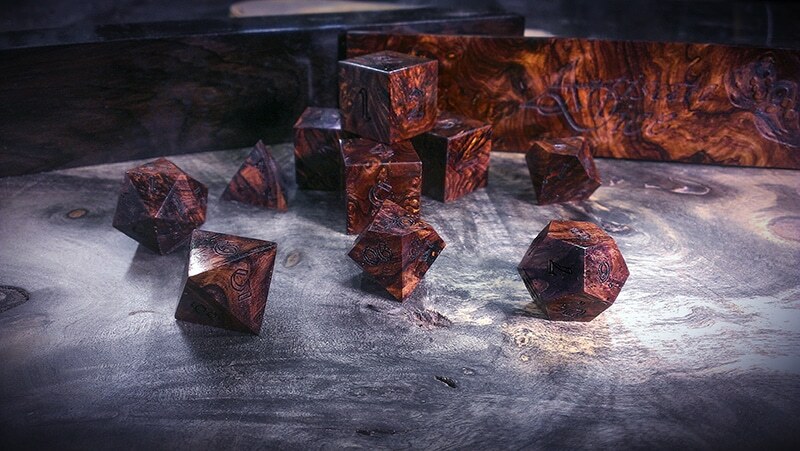 Honduran Rosewood Burl, doesn’t have any equal in the world of burls. Seeing as how these dice are the best we’ve ever made, it only seems fitting that they arrive in a dice box worthy of containing them. To that end, I’ve selected figured Mipingo for the box. The figure in the Mipingo gives the box an onxy like quality when polished to this extent. 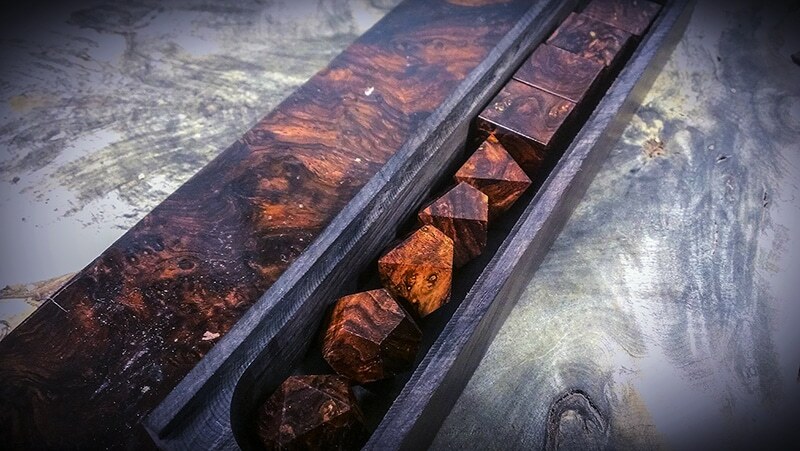 The box was then finished off with a a Honduran Rosewood Burl lid to act as the perfect compliment for these epic level dice. Charlie, any chance of buying a 1d6 or 2d6 (just like the royal ebony in bloodwood box)? if i had any more, then yes we could do that. but alas i am out for the time being.